2. 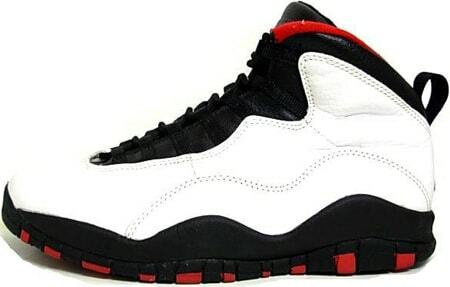 Air Jordan X "Chicago"
Kind of crazy that Harold "Baby Jordan" Miner and Scottie Pippen took it to the house in these before Mike even had a chance to wag his tongue in 'em. With baseball on strike and likely no one to golf with that could handle his wagers (lookin' at you Chuck) Michael came back to the league. The famous 2-3 was hanging in the banners at the United Center so MJ donned the 4-5 which his brand stitched on the Xs. His first year back wasn't a exactly a classic ending as Mike and the Bulls came up short of hardware, but his return assured that the Jordan series would live on. Pairs have sold for stupid money in recent years, but tonight they're back — no two-word fax necessary.